C. H. Spurgeon is known as the ‘Prince of Preachers’. His sermons drew thousands to his church and, when printed, sold in their millions to people in the streets. A hundred years later he is still one of the most popular Christian authors in print.Yet, at the heart of Spurgeon’s desire to preach was a fierce love of people, a desire that meant that he did not neglect his pastoral ministry. He did not regard people as merely souls to be saved; he loved people, and wanted the best for them. 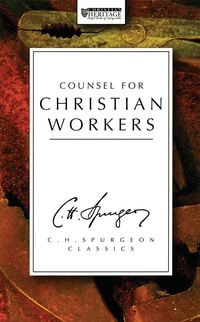 ‘Counsel for Christian Workers’ was produced for people involved in a variety of Christian work. They contain Spurgeon’s clear sighted and pithy analysis and viewpoints on the issues that face such people. Spurgeon was essentially a practical and loving man and this shines through the pages of this collection of his teaching. Here is wisdom that will continue to help Christian workers achieve greater things in their ministry.